Will still be an interesting meeting of course and I wish I could be there for it. This was written by admin. Posted on Monday, November 5, 2018, at 5:52 am. Filed under Uncategorized. Bookmark the permalink. Follow comments here with the RSS feed. Post a comment or leave a trackback. You are always with us in spirit. Thanks for your perseverance Dave! Just fix the roof,crazy prices. For now, though, the township won’t say how much the project will cost taxpayers, even as rumors swirl that the price will be nearly three times as much as the $20 million first estimated. 54 million for a municipal complex the size of ShopRite. 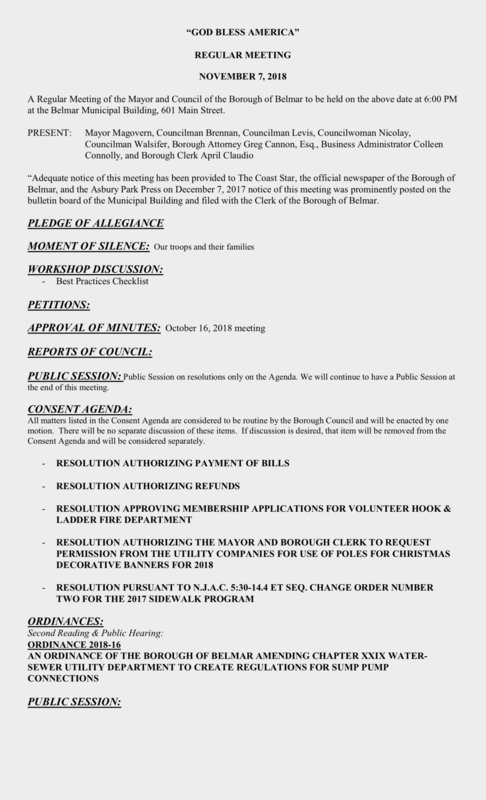 Fix the Roof and proceed to fix the infrastructure to accommodate the 21st century WIFI, SECURITY and multiuser, interactive, full operations management system for Belmar. As more systems moves online why would We ever need a huge town hall.The smaller the better in my book,sorry Liuna union members. Shrink it, everything can be done 21st century electronically. Two customer service desks will work with sophisticated delegation of duties. Human Services Time Study needed now.